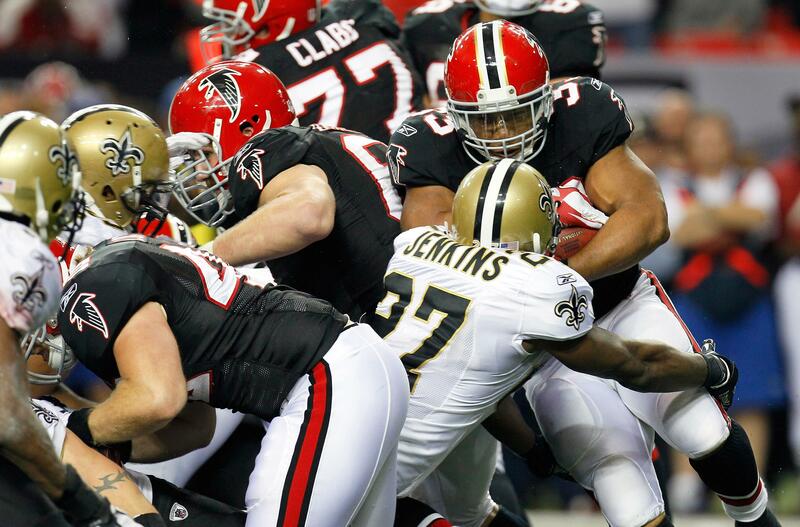 Falcons-Saints fourth down: Atlanta made the right call by going for it in overtime. NFL pundits hate it, but the Falcons made the right call on fourth-and-inches. Whether or not the spread option is the future of the NFL, these Broncos game plans look like something from the past. Denver ran the ball 55 times yesterday; the box score looks like it should have been from a game at Comiskey Park or the Polo Grounds. To put 55 rushes against eight pass attempts into a modern context, the team with the most rushing attempts in history—the immortal 1977 Oakland Raiders—called runs at about a 2-to-1 ratio. As a cautionary tale, those Raiders were forced to take to the air early in both of their playoff games. Only the Ghost to the Post got them past the first one, and Denver’s league-leading run defense stopped them in the second. The conventional wisdom is that teams will eventually stack the box, and yes, we’d like to see the Broncos beat someone with a less-porous front line than their AFC West brethren. But as recently as the mid-’80s, no one could stop the Bears even though they knew the run was coming. (Though Lance Ball is no Walter Payton … unless he is!) The crux of the issue is whether Tim Tebow is a dangerous enough passer to make opponents pay for ignoring him. If this mad Broncos experiment works—and they’ve got nothing to lose by going whole hog—it’ll put the lie to the Year of the Quarterback. The Vikings, who have thrown the ball less than any other team this year, have still thrown it more than they’ve run. The league’s statisticians aren’t even equipped to deal with a run-first playbook of this kind: Tebow had the sixth-best passer rating and QBR on the day. So arbitrary formulas aren’t always the thing. But pure probabilities? Everyone’s an expert today, thanks to the Falcons’ decision to go for it in overtime on fourth and inches from their own 29-yard line. They were stuffed by the Saints, who slotted home a gimme field goal for a big division win. Here is a comprehensive list of every reason why Mike Smith’s decision is being criticized: because it didn’t happen to work. Hindsight is wonderful, and I’m sure every gambler would love to have that arrow of time-violating advantage. But by any conceivable measure, it was the right call. A fourth-and-a-yard succeeds 74 percent of the time, and Michael Turner was not a yard away. The distance was an entire order of magnitude less. If you can’t move the ball a few inches when you have to, you’re not winning many football games. Which doesn’t mean you don’t have to try. Brian Burke at Advanced NFL Stats has picked the perfect day to unveil the Fourthdownulator, a handy little application that allows you to plug in the situation and decide whether going for it makes statistical sense. Before running the fourth-down play, the Falcons’ win probability stood at 47 percent (it would’ve risen to 57 percent had they picked up the first down). Had they chosen to punt, that figure would’ve dropped to 42 percent. The difference is slight but undeniable, and becomes starker when you take into account both the Falcons’ success at running the ball all day and the threat presented by the Saints’ offense with decent field position. If there was a failing on Mike Smith’s part yesterday, it was calling a play where the handoff is made five yards behind the line of scrimmage, facing 11 men in the box. We talked re: Tebow about NFL defenses being able to stop what they know is coming, and there wasn’t even a token attempt to send a receiver wide to spread out the defense. And of course, it’s the safety Malcolm Jenkins who’s able to cheat up and make the first hit on Turner. Maybe this is why coaches are so hesitant to go for it on fourth down: not because they might be unsuccessful, but because everyone’s going to break down why. The whole “job security” question is a traditional reason coaches won’t go for it on fourth; the other is the mythical notion that to do so is to send a message to your defense that you don’t trust them to make a stop, which always seemed like the worst sort of armchair psychology. In fact, that’s exactly what Daryl Johnston cited on the Fox broadcast yesterday: that by not punting, Mike Smith was demoralizing his defense. So, Nate, fighter of safeties: Is the division in the locker room that great that you really have to worry about hurting a unit’s feelings with the playcalling on the other side?